Backcountry gear should be lightweight, durable, and simple: the Spark R&D Arc Splitboard Bindings tick all three boxes. Their T1 system uses an integrated snap toe ramp to positively lock into touring brackets and over any splitboard pucks, making for hassle-free transitions. There are no pins to lose in the snow, no cables to work around, and no reason to take your gloves off. The system sheds snow well, fighting frustrating ice-ups and time-consuming clogs. In touring mode the T1 interface is solid and quiet, with no side-to-side play. The aluminum baseplates have cutouts that minimize weight without compromising strength, setting you up for lightning-fast ascents. In ride mode the Arc highbacks have a soft, surfy feel, perfect for the pow you're working for. Spark R&D is a pioneer in the splitboard world, and the Arc shows it. Tesla T1 System  Tesla T1 bindings slide sideways into the offset touring brackets and are locked into place with the snap ramp. No pins, no cables, no fiddle factor. Whammy Bar Climbing Wire  A single built-in fatty climbing wire with a side arm lever. You can switch easily from stowed, to low (12°), to high (18°) climbing positions and back again while touring, thanks to the T1 Heel Rest. Snap to Ride  T1 bindings slide across pucks utilizing the snap ramp to lock into place for a tight ride down. CNC Machined Aluminum with Maximum Cutouts  The Arc splitboard binding is lightweight for long tours, epic overnighters, trees, and steeps. 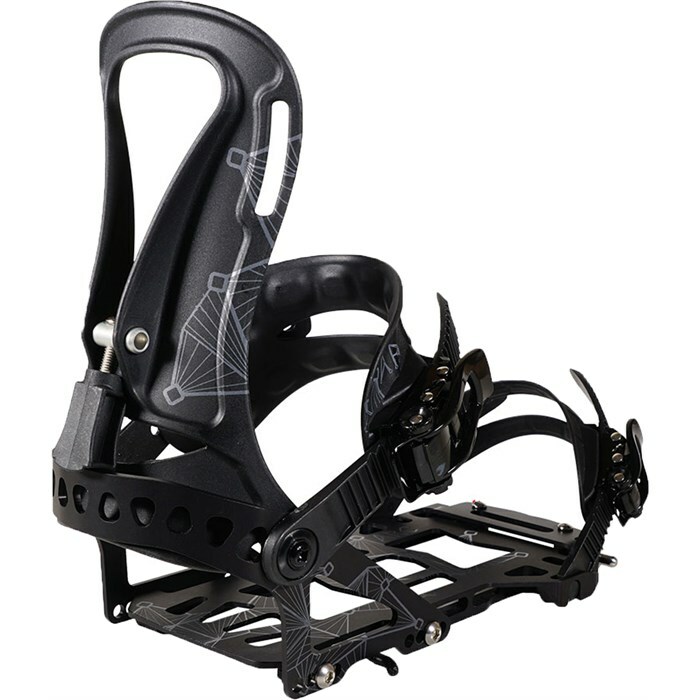 The baseplate is CNC machined with maximum cutouts to shave weight yet maintain strength and performance while incorporating Spark's industry-leading Tesla T1 binding anatomy. Puck Access Through Baseplate  For easy stance adjustments. Arc model only. Pillow Line Straps  Arc Pillow Line Straps are lightweight - 46% lighter than their fabric strap predecessors. They are ultradurable, comfortable, waterproof, one-piece molded construction, and made 100% in-house. Strap pillows are thin and flexible for a comfortable, conformed fit, while thicker ribs are held off the boot and provide stiffness for a uniquely responsive ride. Time-Tested Burton Buckles  All straps incorporate Burton's bomber buckles. Ladders and adjusters are produced in-house with unique thermoplastics that maintain flex over a wide temperature range, performing well on spring tours as well as sub-zero suffer fests. Rip 'N' Flip Highback  The Arc highback has a moderate amount of glass fiber fill for medium flex and a surfy feel. The tool free forward lean adjuster (FLAD) offers complete customization from 0° to 22° in ride mode. The Forward Lean Adjuster toggles easily between forward lean position and -13° touring position for easy transitions. Puck Compatibility  Slide them on and snap the ramp down. Snap the ramp up and slide them off. The most functional way to attach your binding to your board in ride mode, period. Spark R&D bindings are designed to work with all puck compatible splitboard models. In the Box  Bindings, Tesla touring brackets, T1 heel rests, mounting screws, and Spark pocket tool.